DJ-1 antibody LS-C14860 is an unconjugated mouse monoclonal antibody to human DJ-1 (PARK7). Validated for ELISA, IF, IHC and WB. PARK7 / DJ-1 antibody was raised against recombinant human DJ-1 corresponding to the N-terminal region of the protein. Specific for the human DJ-1 protein. On Western blots, it identifies the target band at ~24kD. Reactivity has been confirmed with recombinant DJ-1 protein and PC3 cell lysates by Western blot and with formalin fixed, paraffin-embedded human cerebellum, astrocytoma, kidney, liver and prostate tissues by immunohistochemistry. Suitable for use in Immunohistochemistry, Western Blot, Immunofluorescence and ELISA. 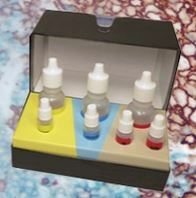 Immunohistochemistry (frozen and paraffin): 5-10 ug/ml. Western Blot: 5-10 ug/ml. Immunofluorescence: 5-10 ug/ml. ELISA: 0.1-1 ug/ml. For best results in immunohistochemistry with formalin-fixed, paraffin-embedded tissues, pretreatment with trypsin is recommended prior to staining.